Your pooch means everything to you. Everything. We get it. We don’t trust people who don’t like dogs, either. But you can trust us because we had our experts research and review some of the best dog beds for labs on the market to bring you a top ten list, so you can get your pal resting easy as soon as possible. Before you start shopping, check out the specifications below that will help guide your purchase. Orthopedic: Perfect for dogs with arthritis and hip dysplasia, orthopedic beds offer the perfect way to take the pressure off of aching joints and muscles. Check this spec to determine if each bed is orthopedic. Dog Size: Whether your pal is large or small, you’ll want to make sure the bed can handle his or her weight. We’ll let you know the maximum amount that each of our dog beds can hold. Washable: Accidents happen, even among the most well-trained pets. Check this spec to find out if each bed is equipped with a removable, washable cover and inner. Color Options: Who says you need to sacrifice style for comfort? Some of our beds come in multiple colors, allowing you to match Fido’s mat to your home decor. See here for options. Size: Your dog may sleep in a cute, cuddly ball or sprawled out like a king or queen. Be sure to check the dimensions here, so you end up with enough space to accommodate your pal. Memory Foam: You’re probably familiar with memory foam because it feels amazing and contours to your body. It feels great to pets, too. Check here to find out if each of our beds has this premium feature. Now that you know what to look for, you’re ready to check out our dog bed buying guide. We searched high and low to bring you a comprehensive list of some of the best sleep spots for pups. If you’re in a hurry, check out our top and budget picks first. If you have the time, be sure to read on to the rest of the list, because each option features great specs and is sure to please. Let’s get started! Treat your pup to our top pick, the Better World dog bed. Designed with supreme comfort in mind, this 5-inch thick bed is made from 100 percent memory foam. It provides superior support for dogs with arthritis, dysplasia, and similar conditions. If your best friend hasn’t been a puppy in a long time, this bed has everything he or she needs to relax in style. It’s the perfect option for senior dogs with weary bodies, but dogs of any age will love the cozy feel of this plush bed. The makers of this bed had convenience in mind, too. They made the zippered cover quickly removable for easy washing. Even better, it’s waterproof. If Fido has an accident, just pop the cover in the wash and you’ll be back in business sooner rather than later. It also features a non-skid bottom, so it won’t slide all over the floor when your dog moves. Available in four color options, you can match the Better World bed to your home decor, making the selection comfortable, convenient, and stylish all wrapped into one great product! Our budget pick is packed full of shredded memory foam to provide your pooch with the ultimate in comfort, breathability, and relaxation! 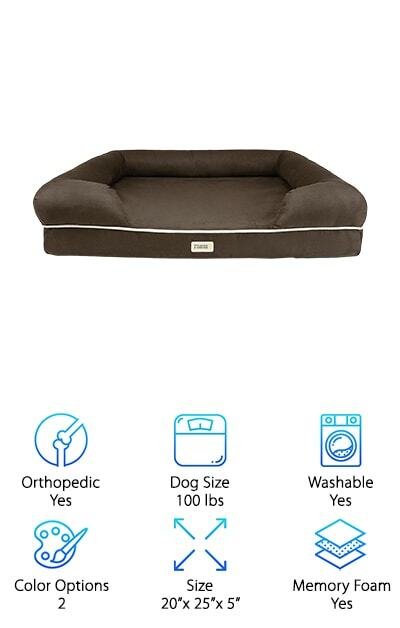 We included the BRINDLE on our top ten list because your best friend deserves a soft, supportive spot to rest, but that doesn’t mean you have to break the bank to find it! A quick search through the best dog bed reviews will undoubtedly lead you to BRINDLE beds as a popular option. 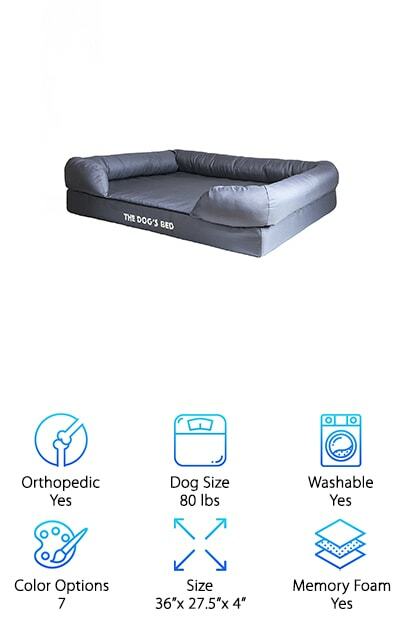 Made with a 3-inch layer of orthopedic shredded memory foam, this bed offers relief for pups with arthritis and other conditions that result in discomfort. Being shredded means ultimate breathability to help cut down on stagnant bacteria that can cause unpleasant smells. Portable and lightweight, you can bring this bed with you on the road, leave it freestanding, or insert it into a dog crate. Finally, the BRINDLE features easy maintenance! The microsuede cover comes off easily and can be put in the washing machine on gentle cycle. Does your dog nibble on everything? When you’ve got a chewer on your hands, it can be hard to find pet-friendly accessories that hold up to sharp canine teeth. Luckily, we came across a tough, durable option during our search and included it for anyone seeking the best dog beds for chewers. Even if your dog goes ballistic on the K9 Ballistics TUFF Dog Bed, the ripstop cover will keep light to moderate chewing in check. It resists biting and scratching and is also waterproof and odor-proof, making it practical and convenient. You have the option of wiping the resilient fabric down or putting it in the washing machine. The polyester mattress resists clumping, moisture, and odors, too, so you won’t mind having this bed in the house. That being said, the K9 Ballistics is also suitable for outdoor use, making it super versatile! The best part? A 90-day chew proof guarantee ensures that if your dog damages the bed within that time frame, the company will replace the cover for free! 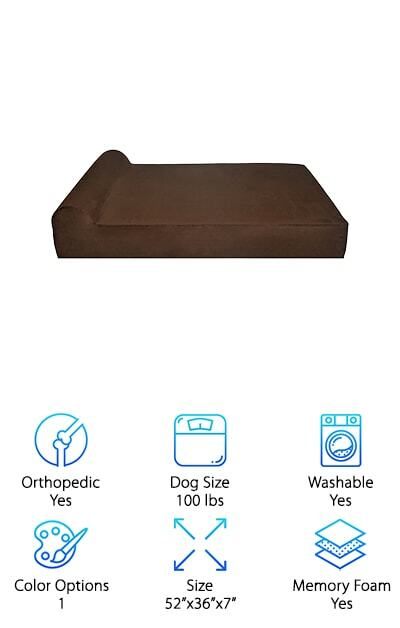 Stylish and comfortable, the Petlo Orthopedic bed is a miniature sofa for man’s best friend. Available in chocolate brown or slate gray, you and your pooch will love the neutral colors and the look of the edged sides. 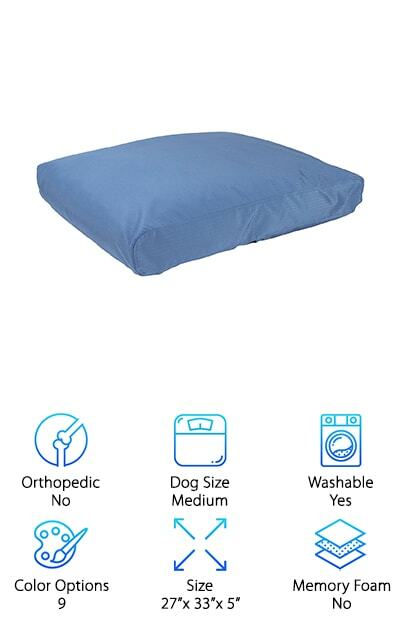 Even better, your dog will appreciate the super soft orthopedic memory foam inside, which reduced pressure and joint pain and promotes peaceful rest. 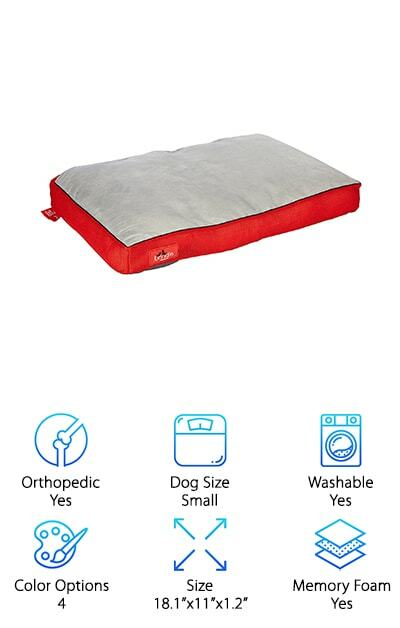 Watch your dog snuggle up comfortably in any room of the house when you choose this portable cushion, available in several sizes to fit your dog perfectly. The Petlo is equipped with a machine-washable cover that is easy to spot treat and remove hair from. The cover is also waterproof, so spills and accidents won’t penetrate through to the memory foam, making this option super easy to maintain. If you’re looking for a memory foam cushion with raised edges for pup to curl into, then the Petlo is the ideal option. Give your dog a luxurious space to lay his or her head. 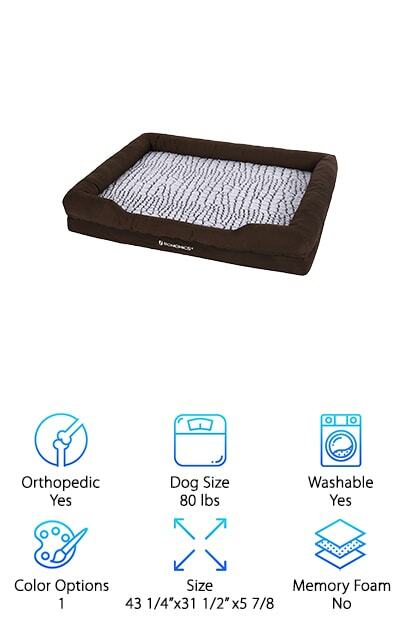 The baby-soft memory foam Friends Forever Premium Dog Bed has all the right features to keep your favorite dog sleeping easy. In fact, it sounds so comfortable, we’re tempted to take a snooze on it, too! Made with plush raised sides, the Friends Forever is the ideal pick for anyone looking for the best elevated dog bed. A thick five inches keeps your pal raised from the ground and lets him sink deep. The supportive side bolsters act as a comfortable, safe pillow. But that’s not all. It gets better. This product is made with heat-treated fibers that are fur resistant, so shedding hair won’t get stuck to the surface. It’s also waterproof and designed to resist sinking and sagging and keep its shape. The non-skid bottom ensures your pooch won’t be sliding all over the floor, making this option safe and favorable for anyone looking for the best for their fur baby. Have a senior dog? You might be wondering about the best dog bed for older dogs. 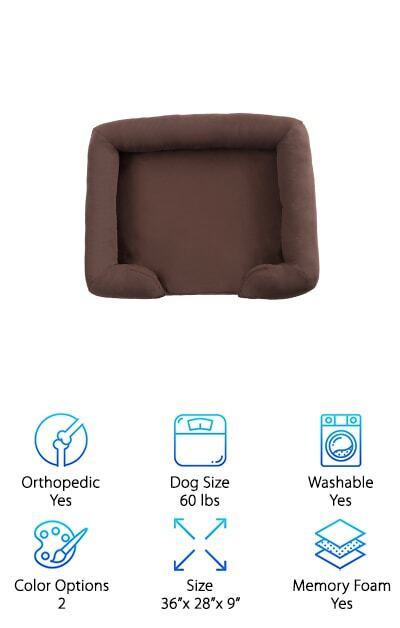 If so, you’ll want to check out the Dog’s Bed Supportive cushion. This large bed comes with 9-inch bolster sides and a hypoallergenic liner, so if you have a pooch with sensitive skin, then this is the ideal model. The 2-inch base provides easy entry and exit and is made from premium, orthopedic foam designed to support aching joints. The waterproof liner protects the Dog’s Bed foam base from accidents and spills. When it’s time to wash the cover, simply unzipper it for easy removal and it runs through on the gentle cycle. And get this: you can use this bed outside, too. The high-quality fabric is resistant to mold, mildew, and dust-mites, so you won’t have to worry that your dog is sleeping on unhealthy pathogens, even if the bed gets stuck outdoors. Give your pet a sound sleep with this luxury bed and enjoy your own restful night with your bed to yourself. Lab owners know their pups deserve the world, which is why we searched high and low for the best dog beds for large breeds. 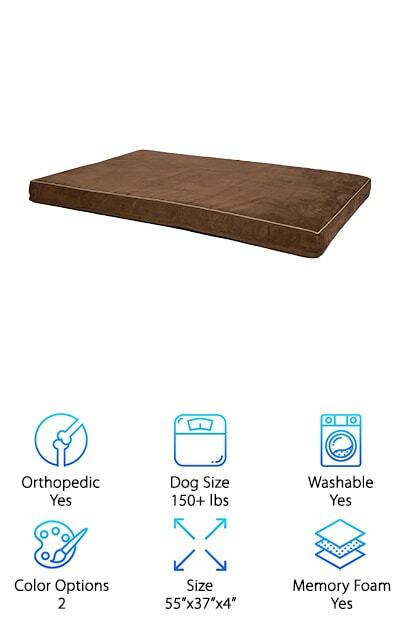 You want your sidekick to feel supported and comfortable every night, so investing in the greatest pet mattress on the market is a no-brainer. 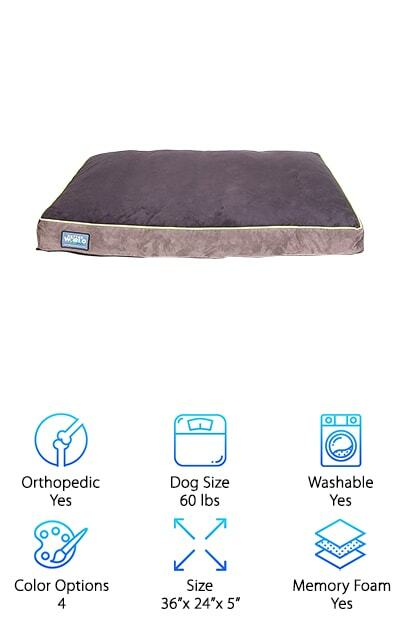 The Pet Support Systems bed is made with three layers of non-toxic, hypoallergenic foam. 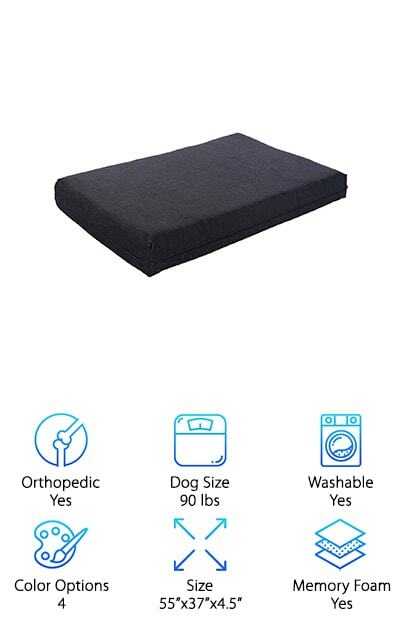 Your pet will sprawl out on two inches of high resiliency base foam, an inch of supportive memory foam, and 1.5 inches of gel memory foam that will keep him cool in the summer and warm in the winter. Talk about layered comfort! Pet Support Systems has been manufacturing ultra luxury pet beds for more than twenty years, so they’ve had time to perfect the technology and care that goes into making every bed. Beyond superior comfort, this mat features a waterproof liner to keep the foam inner safe from accidents. You couldn’t ask for more. You don’t want to compromise quality, comfort, or safety. When searching for the best dog beds for big dogs, you’ll want to check out the Simien Pets Large Dog Bed. Designed for big breeds, it provides optimum support and features a convenient headrest, so your companion can safely elevate his or her head for the utmost coziness. It is made with a high-quality foam that is free from toxins and harmful chemicals, so you know your pooch will be totally pampered with the safest materials. Even better, the foam will not flatten or dent. The liner is waterproof, so you won’t need to sweat accidents or spills. And it’s 100 percent microfiber, machine-washable, and easy-to-clean. Simien thought of everything to bring you a luxury dog bed with all the right features to keep both you and your pup happy and healthy. Equipped with ample space, you might be tempted to curl up with your best friend for a snooze! Papa Pet makes some of the best dog beds for labs around. Featuring a human-grade memory foam mattress inner, the therapeutic properties of this product are unquestionable. Designed to help alleviate joint pain and hip dysplasia, the sound sleep your pal will get when you gift him a Papa Pet will shine through in his energy and mobility. Despite molding to the curvature of your pooch’s body, the four inch mattress never loses its shape, so you’ll both enjoy years of sound sleep. It’s an investment that keeps on giving. The foam is also hypoallergenic and made without the use of harsh chemicals. This is all great, but you might be wondering about Papa Pet’s durability. The lining is waterproof and chew proof, so even if your dog has an accident or nibbles the edge, this top quality model will look good as new. Simply unzipper the liner and put it in the washing machine for easy care and maintenance. Is this the perfect dog bed? We think it might be. Capping the list is the SONGMICS, a plush, cozy bed perfect for pups up to 80 pounds. If you’re checking out the best dog beds for medium dogs, you’re going to want to stand to attention here. This egg crate foam mattress is specifically designed to help alleviate pressure on the muscles and provide a supremely comfy space for sleep. Best of all, it won’t lose its shape to dents or sagging. If you have a small or medium labrador, and you’re looking for a warm bed that is durable and won’t break the bank, you found it. The SONGMICS has all of our favorite features, including a washable cover, non-slip bottom, and pillow-like quality, at a fraction of the cost of more expensive beds. And it’s lightweight, so if you travel with your pup, you’ll be able to easily transport this bed without a struggle. Ideal for both you and your best pal, this premium bed is a stellar way to close out our top ten!